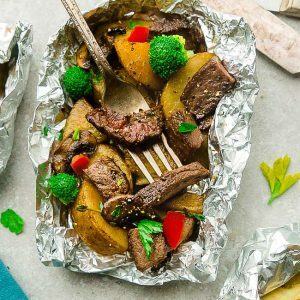 Teriyaki Beef Foil Packets – made with tender steak, broccoli, bell peppers, mushrooms, and potatoes tossed in a sweet and savory Asian-inspired sauce. These bake up perfectly in the oven on a busy weeknight – or toss them on the grill for a weekend summer cookout. This is a sponsored conversation written by me on behalf of Soy Vay®. The opinions are 100% my own. Now that the weather is finally starting to warm up over here, we could not be more excited for patio season. May happens to be National Barbecue month and we’ve been trying to use our grill as often as we can. 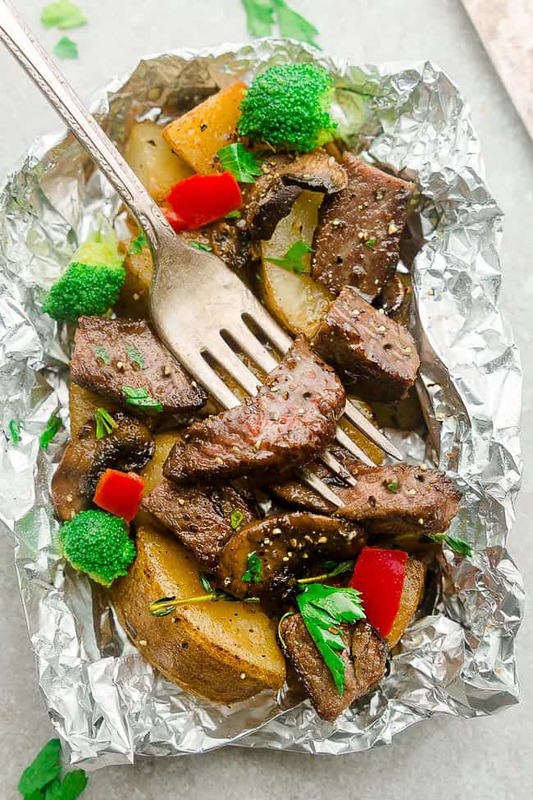 It’s been so nice and sunny and this recipe for Teriyaki Steak Foil Packets is especially perfect when you don’t want to spend a lot of time indoors prepping dinner. It’s an all in one meal that is simple enough to throw together on a busy weeknight and makes an impressive meal if you’re hosting a summer cookout. The steak cooks up tender, juicy and full of flavor thanks to the help of Soy Vay®. Their high quality sauces and marinades make it easy to create impressive meals. We love that they come in a variety of delicious and unexpected flavor combinations that are versatile and contain no preservatives. And right now, they have a 10% promotion code until June 1st if you enter SOYVAY10 when you purchase from their shop. 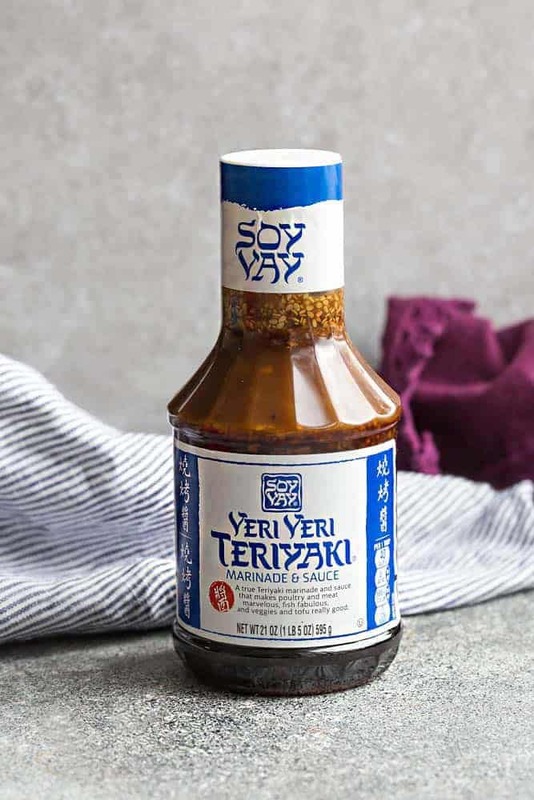 Start off by seasoning the steak with salt, freshly cracked black pepper and Soy Vay®’s Veri Veri Teriyaki® Marinade and Sauce. Using a good cut of beef like Rib-eye, filet mignon or strip steak ensures the steak cooks up nice and tender. Let the steak marinate while you prep and chop your vegetables. Combine the broccoli, red bell peppers, shitake mushrooms and potatoes to a large bowl. Add sesame oil along with more Soy Vay®’s Veri Veri Teriyaki® Marinade and Sauce . In order for the potatoes to cook evenly – be sure to cut them into chunks no larger than 1 1/2 inches. I used russet but baby Yukon or baby red potatoes are also great. Stir in the steak. Divide evenly into foil packets and cook on the grill with the lid closed for about 8 minutes. Flip the foil packets and cook until desired doneness. If you like a nice char on your steak, add them directly to the grill during the last few minutes. CAN I MAKE THESE FOIL PACKETS IN THE OVEN? 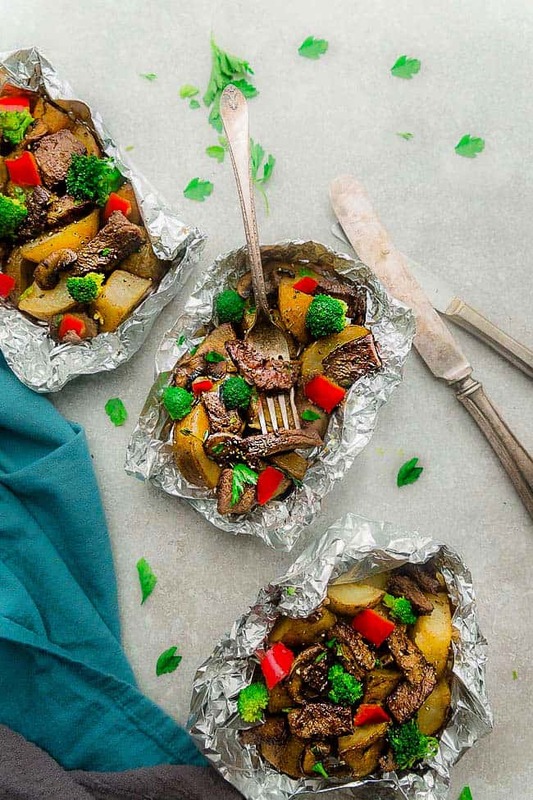 To make these foil packets in the oven, add the foil packets onto a baking sheet and cook for 18 minutes at 425 F.
For that nice char on the steak, broil for an additional 2-3 minutes with the foil open. WHAT OTHER VEGETABLES WOULD GO WELL WITH TERIYAKI BEEF? You can use a different combination of vegetables and mushrooms if you want to switch things up. Snap peas and green beans would be great along with some shelled edamame beans. WHAT ELSE CAN I SERVE TERIYAKI BEEF FOIL PACKETS WITH? These foil packets are a delicious all in one meal on their own but you can also serve them with cauliflower rice, zoodles, Jasmine, brown rice or quinoa. 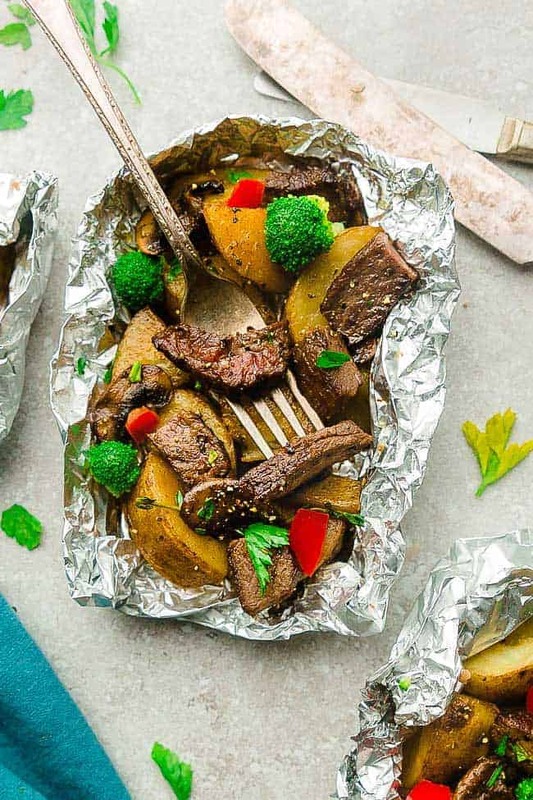 Teriyaki Beef Foil Packets - made with tender steak, broccoli, bell peppers, mushrooms and potatoes tossed in a sweet and savory Asian-inspired sauce. These bake up perfectly in the oven on a busy weeknight - or toss them on the grill for a weekend summer cookout. Season steak with salt, pepper and 3 tablespoons of Soy Vay®’s Veri Veri Teriyaki® Marinade and Sauce. Add mushrooms, potatoes, broccoli and bell peppers in a large bowl. Add sesame oil and remaining Soy Vay®’s Veri Veri Teriyaki® Marinade and Sauce and toss to combine. Gently stir in the steak. Place foil packets on a baking sheet and cook for 18 minutes (rotating tray once). Open foil packets then return to oven and turn to broil. Cook for an additional 2-3 minutes, or until steak is slightly charred. Remove baking sheet from oven. Seal the packets again and allow to stand for an additional 6-8 minutes so the potatoes continue to steam and cook. Sprinkle with fresh parsley and additional black pepper, if desired.